I discovered this weekend that I hate the woman Jesus healed. I'll back up just a second for a few of you new readers. We are in the middle of a series called The Dirty Gospel. Loss & Depression then a post about God's love being a severe and painful mercy. A man named Jairus pleaded with Jesus to come and heal his dying daughter. On their way the woman with the issue of blood reached out and touched Jesus. At that moment Jesus stopped and healed that woman. Yippee, right? Not for Jairus. While this woman was getting her healing, a messenger came and told Jairus that his daughter was dead. Jesus was too late. Jairus was first and she cut in line. This is where I realized that I despised this woman. Well, not this actual woman. But what she represents in my life. All those times where I am begging God, but it seems that He is too busy helping others. I am crying about my financial lack, only to learn that someone else received a significant amount of money as a random gift. What the heck, God? It isn't fair that they have so much and I have so little. We have been in the process of adopting for almost four years. FOUR years. In that time I have seen so many families bring home their little kids. I guess Jesus was too busy helping them that He forgot about my waiting family. They only had to wait a year. It isn't fair. We planted a church in a city that didn't seem to care about God. In our first few months in Seattle we talked to 2,000 people about Jesus. Want to know how many came to church? Two. Just two out of two thousand. Meanwhile in another American city, revival is breaking out and churches are growing out of their spaces. God, we are doing what you asked us to do. Why isn't anything happening? This isn't fair. Maybe for you, it is marriage. Or family. Your friends seem to be having all the luck with romance and babies. Perhaps you have been working hard in your career only to watch a co-worker get the promotion. Waiting for God to move, only to watch Him part the waters for someone else. All the while, we feel like we are dying just like the daughter did. Jesus was too late. He wasn't fair. I have died waiting for a Savior who seems to have gotten distracted. When I see people around me getting what they are desperately seeking from God, I cringe. Because in my little way of thinking I somehow conclude there is now less for me. Maybe Jesus used up all His magic sprinkles for their miracle. Will Jesus run out of His miracles before He gets around to me? I think that when Jesus is working on behalf of someone else, it means I am still sitting on the to-do list. Maybe He will get around to me, maybe not. Fingers crossed I don't die waiting to find out. Then I remember the truth and I take heart. The story ends with Jesus going to Jairus' daughter and raising her from the dead. Jesus didn't just show His power in her life by healing her. He did something bigger and more unexpected. And that's what we hope in. There are days it feels like we watch another get our blessing. The spouse we want, the kids we crave, the bank account we dream of, the job we've worked hard for and the recognition we think we deserve. And maybe it isn't fair. Fair = reasonable. Not sure about you, but I'm glad God isn't reasonable when it comes to the Gospel. I don't deserve it and if He was fair then I'd be a goner. The Gospel isn't fair. It is more than that. It is ample, generous, and extravagant. ---> click to tweet. Sure, sometimes waiting for God kills us. It kills our flesh to make room for something bigger. If we watch a dream die, it is because God is going to call forth something bigger and more grand than we were ever imagining. Remember how only two out of two thousand came to church? God did a miracle with those two girls. He birthed a church. They gathered a critical mass of friends and our church began to grow and take off. What seemed like death was God's way of bringing life. 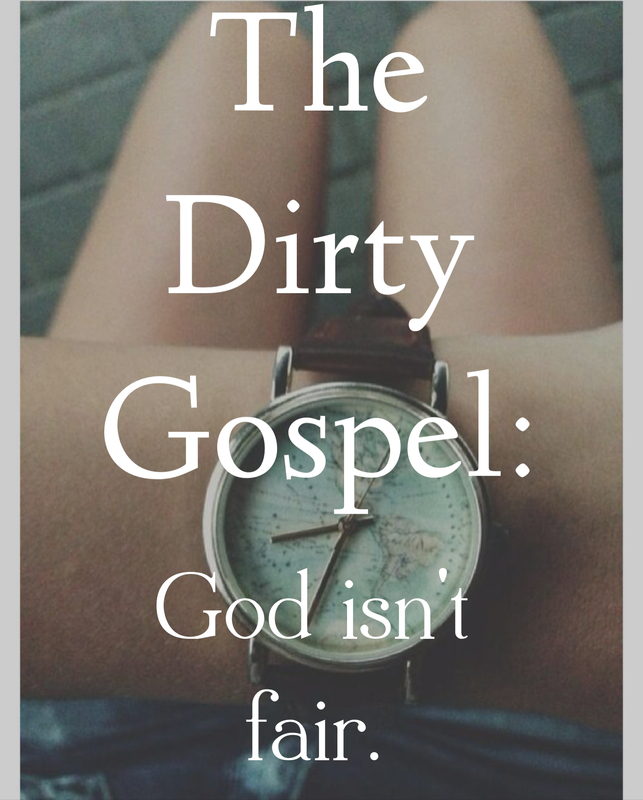 The Gospel is dirty because it kills us sometimes. It kills our misperceptions and wrong expectations. It kills our selfish ambitions and pride. But, God never leaves us dead. He raises us up into the life He has destined for us. Leave a comment or share this post via Twitter or Facebook by clicking here.